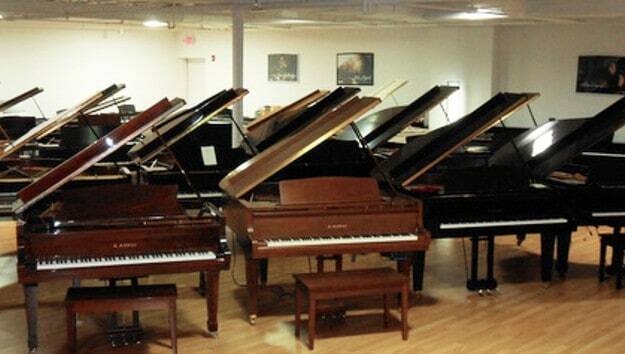 We carry the largest selection of Fazioli pianos in the country. Each individually hand-crafted Fazioli piano model was designed by Paolo Fazioli and his engineering team. Paolo’s love for music, scientific expertise, skill as an artisan and passion for research, combined with rigorous material selection make each Fazioli piano a masterpiece. The degree of handcrafting is so extensive that it takes up to three years to build a Fazioli piano. This coveted piano is considered to be the finest performance piano in the world by an increasing number of professional pianists, some of whom will play no other. 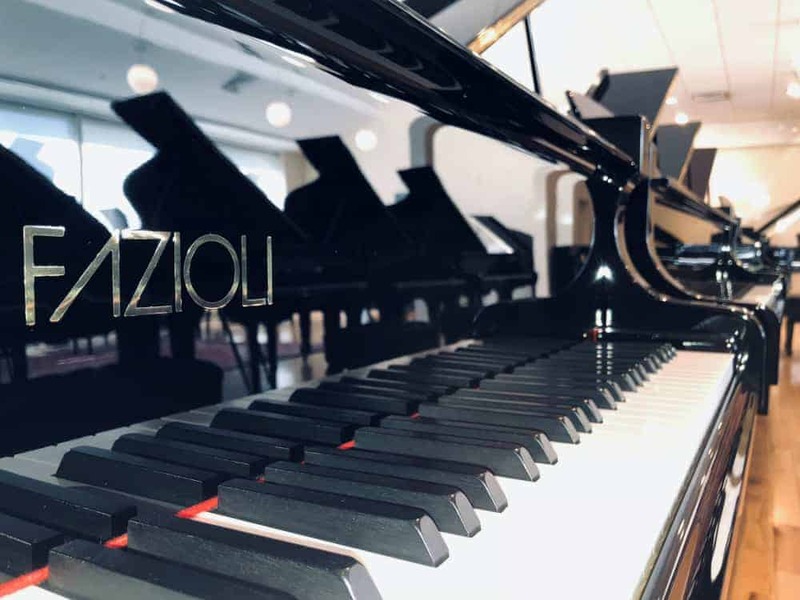 Fazioli Pianos, founded by engineer and pianist Paolo Fazioli, has been producing pianos since 1981. The Fazioli factory is situated in Sacile, Italy, outside of Venice in an area that boasts a time-honored and prestigious tradition in the art of wood working. 120-130 Fazioli grand pianos are produced each year. 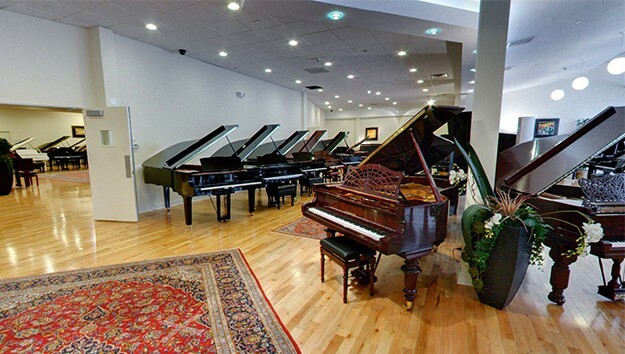 Fazioli specializes in producing only top-of-the-line grand pianos. Fazioli creates some of the most attractive art cases in the world, thoroughly complimenting the supreme quality of the instruments. 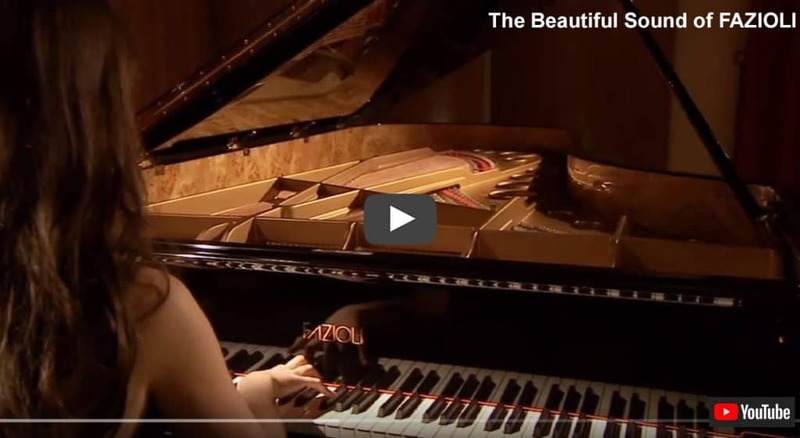 See why Fazioli pianos are the most exclusive pianos in the world. A Fazioli takes up to three years to produce. Find out why it is… A Piano Worth Waiting For. The Fazioli piano has been selected to appear at the most prestigious piano competitions, including the Chopin Competition in Warsaw, and the Tchaikovsky Competition in Moscow. At the most recent Rubinstein International Piano Competition in Tel Aviv in 2014, five out of the six finalists chose the Fazioli piano for their concerto performance. The Fazioli is considered by so many professionals to be the best piano produced in the world today, sitting in a class of its own. The Fazioli piano is the most exclusive piano available today. Production is very limited- only 120 grand pianos (no uprights) are produced per year. In 1978, musician and engineer Paolo Fazioli of Rome, Italy, began designing and building pianos, with the object of making the finest-quality instruments possible. Now even the most famous piano makers of Western Europe are recognizing his accomplishment, and artists throughout the world are using the instruments successfully on the concert stage and elsewhere. As a youth, Fazioli studied music and engineering, receiving advanced degrees in both subjects. He briefly attempted to make a living as a concert pianist, but instead joined his family’s furniture company, rising to the position of factory manager in the Rome, Sacile, and Turin factories. But his creative ambitions, combined with his personal search for the perfect piano, finally led him to conclude that he needed to build his own piano. With advice and financial backing from his family, in 1977 Fazioli assembled a group of experts in woodworking, acoustics, and piano technology to study and scientifically analyze every aspect of piano design and construction. The following year, prototypes of his new instruments in hand, he began building pianos commercially in a factory housed at one end of the family’s Sacile furniture factory, a top supplier in Italy of high-end office furniture. In 2001, Fazioli built a new, expanded, modern piano-production facility, and in 2005 opened an adjoining 198-seat concert hall with a stage large enough for a chamber orchestra, where he maintains a regular concert schedule of well-known musicians who perform there. The concert hall is designed so that it can be adjusted acoustically with movable panels and sound reflectors to optimize the acoustics for performing, recording, or testing, and for different kinds of music, musical ensembles, and size of audience. 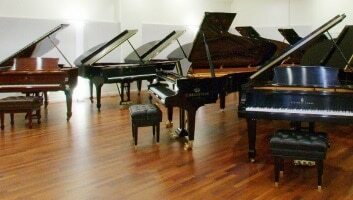 The hall is used for the research and testing of pianos — every instrument Fazioli Pianos makes is tested here. In addition to these activities in the concert hall, the new factory also contains a department for ongoing research in piano design in cooperation with a number of educational institutions. Fazioli Pianos builds only grands, about 120 per year, in six sizes from 5′ 2″ to 10′ 2″, the last one of the largest pianos in the world, with the further distinction of having four pedals. Three are the usual sustain, sostenuto, and una corda. The fourth is a “soft” pedal that brings the hammers closer to the strings — similar to the function in verticals and some older grands — to soften the sound without altering the tonal quality, as the una corda often does. A unique compensating device corrects for the action irregularity that would otherwise occur when the hammers are moved in this manner. The fourth pedal is available as an option on the other models. 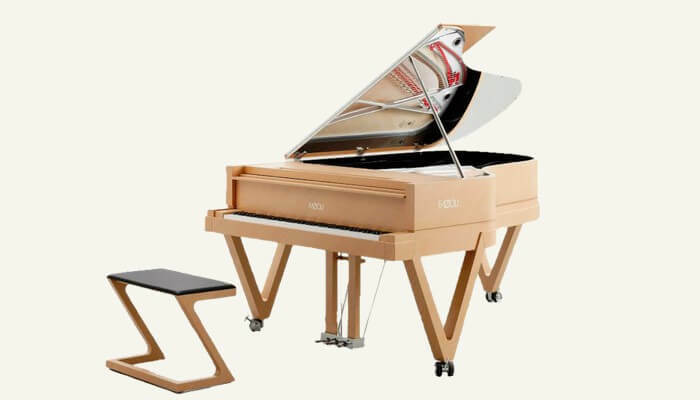 Fazioli Pianos also offers two actions and two pedal lyres as options on all models. Having two actions allows for more voicing possibilities without having to constantly revoice the hammers. A second pedal lyre containing only three pedals can be a welcome alternative for some pianists who might be confused by the presence of a fourth pedal. All Fazioli pianos have inner and outer rims of maple, and seven-ply maple pinblocks from Bolduc, in Canada. 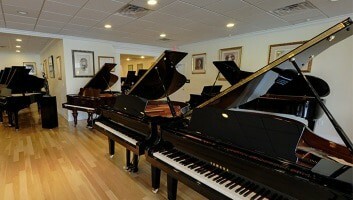 The pianos have Renner actions and hammers and Kluge keyboards. The bronze capo d’astro bar is adjustable in the factory for setting the strike point and treble string length for best high-treble tone quality, and is removable for servicing if necessary; and the front and rear duplex scales can be tuned to maximize tonal color. The company says that a critical factor in the sound of its pianos is the scientific selection of its woods, such as the “resonant spruce” obtained from the Val di Fiemme, where Stradivari reportedly sought woods for his violins. Each piece of wood is said to be carefully tested for certain resonant properties before being used in the pianos. Similarly, three different types of wood are used for the bridge caps, each chosen for the most efficient transmission of tonal energy for a particular register. An incredible level of detail has gone into the design and construction of these pianos. For instance, in one small portion of the soundboard where additional stiffness is required, the grain of the wood runs perpendicular to that of the rest of the soundboard, cleverly disguised so as to be almost unnoticeable. The pianos are impeccably prepared at the factory, including very fine voicing — even perfect tuning of the duplex scales. A series of stunning art-case pianos is a testament to the ability of the Fazioli artisans to execute virtually any custom-ordered artistic variation on the six Fazioli models. Many artists, and others most familiar with Fazioli pianos, describe them as sources of inspiration with a wide color palette and dynamic range, and combining great power with great warmth in a way that causes music played on them to “make sense” in a way made possible by few other pianos. Each Fazioli piano is built saving one ton of carbon dioxide, thanks to the use of electricity produced by a new photovoltaic system installed on the roof of the Fazioli factory. 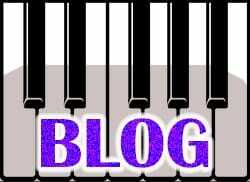 The content above is fully credited to the Piano Buyer, and can be found in its original form on their website.